Next we need to amend our Producer. Open the Producer.cs file from example 1 . 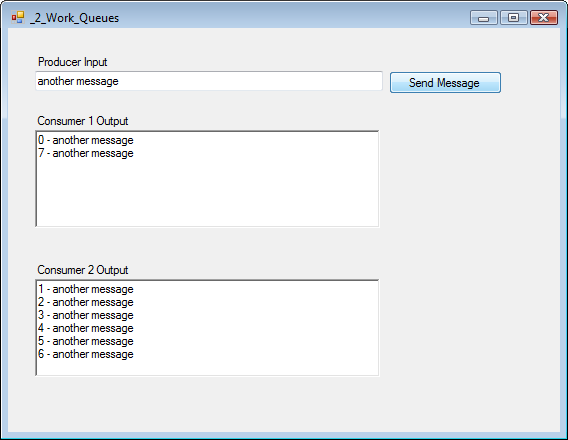 Then in our SendMessage method we need to ensure we publish a persistent message. OK, now onto our Consumer. 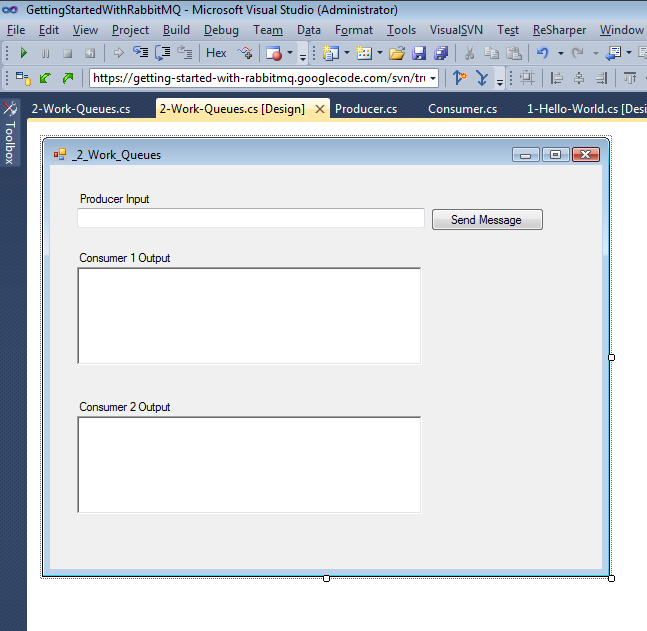 Again, open the Consumer.cs class from the original example and adjust the constructor so the queue is durable. Now we need to build our new Form. We’re going to be running a second consumer so we need to have somewhere to show the output from this. Copy the controls from the original Form and Add a second RichTextBox. 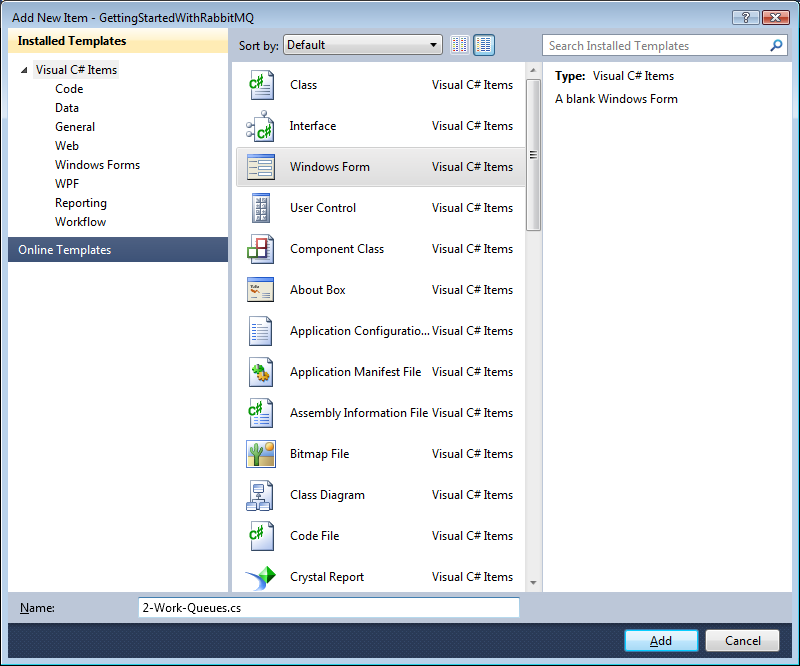 Right click and “View Code”. We need to use a new Queue so change the QUEUE_NAME constant. We also need to declare 2 Consumers. And initialise our second Consumer which will pass a message back to a new event hander handleMessage2 that update the second RichTextBox. We also want to track the order the messages are delivered so we will create a new count variable and pre-pend this when we send a message. Now hit debug (after making sure RabbitMQ broker is running). Add a message in the TextBox and hit send a few times, this is what you should see. Notice the work is evenly distributed. To make it a little more realistic, we’ll add a pause to handleMessage. Hit send a few more time, now you should see something like this. Consumer 2 has handled more messages as Consumer 1 is busy. Really deserves a spot on the official site, next to the Java and Python samples. Keep it up! 1) Why are you calling Abort() instead of Close() on Model? in the Dispose() implementations? 2) In general is calling Close() on Connection (and on Model) preferred over calling Dispose()? If so why? 3) Why is the connection closed before aborting the model? Shouldn’t the order be reversed? 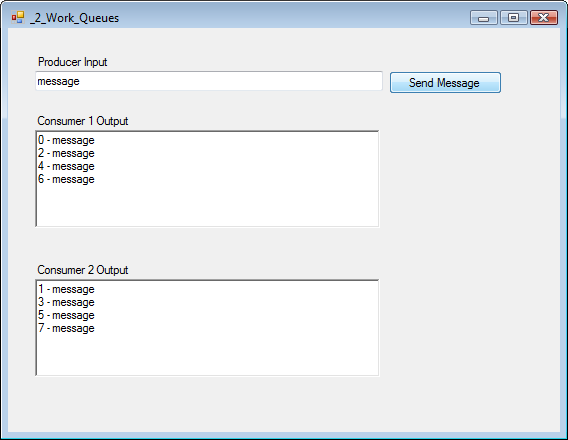 4) Its a bit disappointing that the Rabbit-MQ client for .NET does not natively support an asynchronous callback mechanism for consuming messages like the client for Python does for instance (as illustrated in the tutorials on the Rabbit MQ website). Do you know of any other .NET client library which supports this? Any idea if the Rabbit MQ team is planning to add this support any time soon?